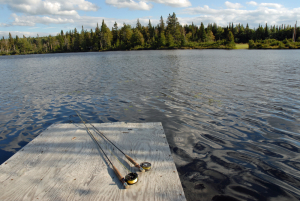 Home to loons, horned pout and wonderfully colored brook trout, Clarksville Pond spans 25 acres at the top of the world! This is a great spot to watch the night sky! This special spot is fly fishing only and easily accessible by a good gravel town road. Clarksville Pond is know for its Green Drake hatch. Directions from Lopstick: Take US Route 3 south to Route 145. Go approximately 5 miles. You will go up and over Ben young Hill. The vistas from here are gorgeous! As you near the bottom of Ben Young Hill you will enter an S curve. There will be a road to the left. Bear left again and that is Clarksville Pond Road. Go to the top of the hill, Clarksville Pond will be on your left. There is a decent small boat launch there.